When I hear someone reference their “salad days,” I envision a younger, successful version of that person. Or, in terms of lifetimes, I think of a bygone era of upright, suburban subdivisions filled with well-adjusted families, nice lawns, practical cars, and financial security. I might envision my own idyllic childhood. However, today I am thinking of a particular and brief period of my life filled with far less love, home, or security. It was filled with actual salads. Nearly 30 years ago, I left home, moved to another state, and shared an apartment with my boyfriend. It was a nice place but expensive. Not long after arriving, I had to pick up a second job. I worked 60 hours a week just to earn enough money to cover my share of the bills. I had no extra cash for luxuries like concert tickets or dining out at the local burger joint. And my reality was so much better than those who were living on the street and unemployed. I just wasn’t prepared for such a dramatic change in my life, and I had no understanding for how much in my life that I took for granted. I was overwhelmed. So, while mine were just #firstworldproblems, I soon found myself exhausted, stressed, and looking for a way out. In fact, I ended up looking down the wrong end of a gun. A huge gun. I think it was a .44 (but it could have been his 9 millimeter). Honestly, I wasn’t focused on which model my boyfriend was pointing directly at me. I was begging for my him not to pull the trigger. Without going into detail, let’s just say that whatever caused the showdown, it did not validate the brandishing of a loaded firearm. I had no weapons and was physically disadvantaged. I had only my wits and a strong bladder. Leaving alive was the only other option provided at the time, and I took it. That very night. Newly single and in a town with no family, no friends, and too proud to return home. I soon found myself living paycheck-to-paycheck and week-to-week in a large residential hotel. I paid my rent in cash, weekly, to a creepy guy on the first floor. While I had no view, it was relatively clean but spare. My room had a bed and a sink. There was no kitchen and “no hot plates allowed.” I shared a bathroom with everyone else on the floor. I was the newbie and quickly figured out the order of things. With no seniority, my bathroom privileges meant that my showers were late at night and luke warm at best. But I had a roof over my head. I was sober, focused, and healthy. I had a job on the night shift at an ice cream shop near campus. Best of all, I had a new chance at life. And, for a few months, I lived on only one meal a day. I could afford one, fresh, healthy meal. So, I made it special. Each afternoon before my shift, I would walk to Cafe Intermezzo and order a salad. This was not just any salad. The broad bowl overflowed with a healthy mass of vegetables tossed in a delicious house-made poppy-seed dressing and was topped with a hearty slice of freshly baked whole grain bread. I considered it the food of the gods. I enjoyed those meals. Usually, I sat near the window to watch people going about their lives. I believed that my life could only get better, and it has. Now is the period when I have felt the most loved and secure. Now I am blessed with a home where I can prepare a meal for my loving family. But 28 years ago? Those were my salad days. Wednesday, November 19, 2014. 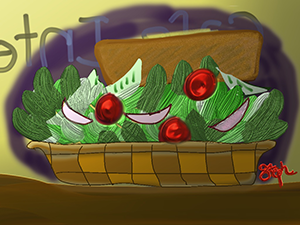 I wrote “My Salad Days.” I was inspired by today’s writing prompt “Salad Days” from Daily Prompt “Is there a period in your own personal life that you think of as the good old days? Tell us a story about those innocent and/or exciting times (or lack thereof).” I created the image using ArtRage 3 on my iPad. Wow. When I started reading this post, I had no idea what direction it would take. I’m so glad you had the courage and the strength to get out of a bad situation! What a scary time. I will fully admit to being spoiled and taking life for granted. This definitely made me think and count my blessings. I didn’t intend to go so dark with this post. It just seemed to flow out of me. I appreciate your comments, and truly appreciate your stopping by. Katie! I wish that I could write about my younger days as being that eventful and / or colourful. Be that as it may, it is now salad and soup days most days for me! And that is when I can afford five course meals three times a day too! My memory of that time has stuck with me all these years. But I can’t remember what I had for dinner last week. It must be the weight (strength?) of the emotions that I was experiencing at the time. Thanks for your comments, Rummuser! Thanks, and I am so glad you did too!